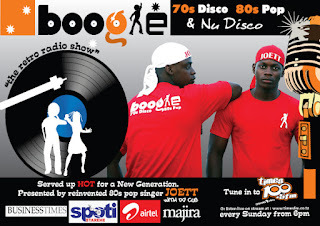 In last week's retro radio show Boogie we brought you 1980s Sister Sledge classics AND 1980s Boney M classics. Boy oh boy, what an interesting combination that was. We kicked off with Sister Sledge in the first hour and at the top the hour – in the Airtel sponsored segment of the show from 7pm, we featured Boney M. Today, I'm going to go back to the old format a little, and that is to mix it all up with disco classics by various artists from the 70s and 80s. Expect dance floor classics from The Trammps, The Jacksons, Sister Sledge, Patrice Rushen, Rose Royce, Chic, Stacy Lattisaw, Melba More, Patti Labelle, KC & The Sunshine Band, Billy Ocean, McFadden & Whitehead, Rufus & Chaka Khan and MORE. Are you ready to Boogie? Be sure to tune in to Times 100.5 FM from 6pm Sunday East Africa Time, Or Listen live on stream at timesfm.co.tz For International listeners, view World Time Zone Map for current time in your area. Last Sunday I ran Yowsah Yowsah Yowsah 70s New York Disco. 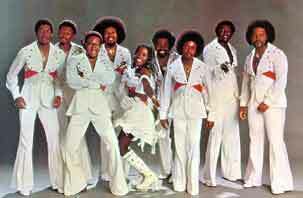 It had been several weeks since I last played disco music from the 70s. We'd had a five week Chaka Khan album series that always included an 80s set in the second half of the show. 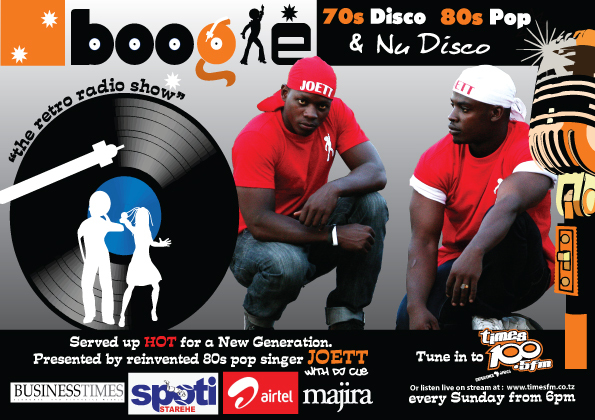 So yeah, I feel great about revisiting the 70s with a full show dedicated to 70s disco. I also managed to squeeze one Nu Disco track at the very end of the show, which was nice. 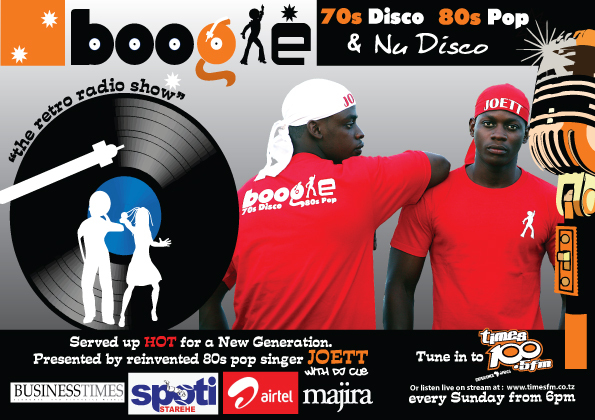 And that's why I thought, well, I'll dedicate the first hour of the show today to Nu Disco and then give you Boogie You Select Boney M Greatest Hits in the second hour, where you -- the listener, gets to select the playlist for the rest of the show. We've got a new ad campaign in Business Times this week. The interesting part are the two male models sporting Boogie t-shirts in the ad campaign. Yes, Boogie now has the branded t-shirt, as it should. The plan is to get these in stores soon so you Boogie fans out there can buy yourselves these neat t-shirts with Boogie logo up front, and the boogie tagline in the back. So catch you guys later, have a great weekend! It really pains me to see how people struggle with projection. If you sense your voice is weak or that it has no power behind it when you sing certain notes, you'll need to take a quick step back to analyze how you sound. Take a good hard look at yourself in the mirror if you can while you're at it. I'm going to point out the most common reasons why good projection eludes a lot of people, and how to quickly fix the problem. I don't know if you're aware of this, but when you speak your voice is at its most powerful. Why then do you struggle to project the same power when you sing? The reason is very simple. 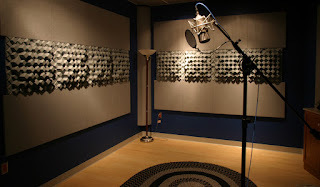 You're not using your speaking voice to sing. And I'll warn you right here. This is the hardest bad habit to kick. And here's another reason why you're experiencing the undesirably low levels of projection with your voice. You're lacking thrust. Yes, if you don't push it isn't going to happen. So how then do you fix this singing problem and break the cycle of bad habits that have plagued your advancement as a singer? Here's what I'll recommend you do. Read the full article here!